Here is the Bluefly accessory wall filled with men's accessories! Will we ever see this again? I have to say that I am appreciating the accessories much more this season. I can not remember even a single pair of shoes from any previous season's wall, but I probably will never forget the blue boots that Elisa chose for the first challenge. By the way - those are sold out. How about these fierce boots worn by Ricky's model, Lea in episode two? It's clear that we will have to make our decisions quickly if we want any of these items. Fortunately the Bluefly team gives us lots of options. Check these out. Also, there is a 10% off coupon for BPRs on our comment page. This is good for new customers spending over $100. Have you been playing the sweepstakes game? I play every day (because I really want to win the tickets!) and afterward I usually receive a discount coupon in my in-box. This week our friends at Bluefly are emulating the winning look designed by Jack Mackenroth. As you can see, they didn't find the bias cut placket or pocket but they feature the stripes, the slim-tailoring of the trousers and they definitely have the shoes that pull together the look. We have heard your questions about the episode and I have a couple of answers. 1. Was it against the rules for Jack to trace his pants? No. 2. Was it against the rules for the designers to share the pattern? No. 3. Were the designers supposed to be making the garment to fit Tiki Barber, or to fit their models? Their models. 4. On the Today Show, was Tiki wearing the exact clothing that Jack made, or were the garments re-made in Tiki's size? They were re-made. 5. Were the designers supposed to make three pieces? Yes, that was the original challenge. It was certainly a treat to have Tim Gunn visit us here in Scottsdale. The event was a Liz Claiborne Fashion Show followed by a Q&A, book-signings and photo opportunities with Tim. Plenty more where these came from, stay tuned for part 2! And we are keeping a close eye out for Jay McCarroll too! Amanda's Take - Episode Three - "Salute Your Shorts"
Episode 3: SALUTE YOUR SHORTS! Menswear. You know Emmett and Keith were screaming at their tvs! I am definitely not the expert on men's clothing, although I do know a well-constructed and well-fitted garment when I see it. But let's get to what you want to hear from me... what do I think about the male models? Once again we have the Project Runway Canada video courtesy of the sublime MsRoyalT. Click here for the rest of the episode. Afterwards, check out Rondi's recap. We are loving PR Canada! Who Will Win the Gift Bag? It's a Walk Off! Only those readers are eligible (and TBONE, I'm watching you). The first one that answers ALL THREE of the following questions correctly IN THE COMMENTS will win the prize. Name the location of the auction in the 'Envy' (aka 'Vision') episode in Season 1. Name the models involved in the infamous 'Walk Off' in Season 2? Which airline transported the designers to Paris in Season 3? The winner will be asked to email his/her real name and mailing address to Team BPR. ETA: Congratulations to FLUFFYRILEY for being the first to answer all three questions correctly. Check back with us next week when we will be offering a new prize. And don't forget to make your picks and BE SURE TO HIT 'SUBMIT' before you exit! The Recap of the Manolo! Menswear does not fall under the purview of the fashion designer. It belongs properly and only to the tailor, to men who have devoted their lives to the arcana of button holes and pick-stitched lapels and French facings, and who know that what matters most in menswear is material, cut, fit and detail. You cannot really learn this at the fashion college. Such knowledge can only be acquired through long apprenticeships at the feet of masters. Yes, the big fashion firms can mass produce the similacra of good tailoring–the off-the-rack suits that look moderately presentable on the size 42 regular–but it is not the same. And you can take him home with you! 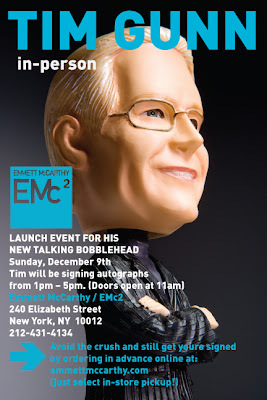 Visit EMc2 on Sunday, December 9th between 1 and 5 pm and have Tim Gunn sign your new, talking bobblehead. Doors will open at 11 am so you'll have plenty of time to do your holiday shopping and perhaps pick up a new frock, shoes, jacket or coat to be properly stylish for your introduction to Tim. Already have the 'vintage' Tim? He needs a friend! One that can tell you to "make it work" and can proclaim you to be "fab-u-lous" just when you need it. As a proud owner of both versions of the bobblehead, I can tell you that this one is even more dapper and certainly more loquacious. Even Nina Garcia would not be disappointed in the construction details of this mini-mentor who reminds you to strive for quality, taste and style. The Tim Gunn Talking Bobblehead is perfect for those holiday gift exchanges or for that hard-to-shop-for friend on your list. Pre-order it to pick up at the store and plan to meet Tim! They are sure to go quickly so what are you waiting for? Carry on! Tonight we meet Lori, a woman that needs to come to recognize that depth of her beauty was not scarred by her accident. Click here for the Yahoo video. First of all you listened to the needs of your client. You understood the tailoring and fit challenges of a muscular man because you face them yourself. And you got that Tiki Barber wanted those unexpected touches of whimsy you achieved with the fabric on the bias. You gave Tiki a look that was appropriate to both his profession and physicality and he loved it. (Click here to see the Today Show video.) Bravo, Jack! This post is only for POSITIVE words for Jack Mackenroth. If you have comments or opinions about other work please visit our reaction post here. This was the toughest challenge in Runway history and nothing in your career had prepared you for this moment. In this case you couldn't call upon your modeling experience to help with the styling. Designing an ensemble for a muscular former athlete is difficult but add the fact that he is now a morning show personality and you have a recipe for panic in the workroom. You persevered with your ambitious project but time was not your friend. We had the opportunity to see your strong aesthetic in the first episode and your ability to work as a team in the second. We know we will see more of this talented Sistah. This post is only for positive words for Carmen Webber. If you have anything negative to say, please click here. Photos courtesy of Bravo. Click to see a larger view. You've seen the designs on the runway and now it's your turn to be the judges. This week you are Heidi Klum, Nina Garcia, Michael Kors and Tiki Barber. Click here to tell us who you thought should have won the challenge. Click here to tell us who you thought should have been auf'd. Project Runway shook things up a little tonight with a first ever menswear challenge. What did you think? Post your reactions to Episode 3 here. The BPR party room takes up temporary residence at 10 Rock tonight as we celebrate Episode 3 of Project Runway Season 4. As the designers face "the most difficult challenge ever", the BPR party people will be at the ready with plenty of snark. Everyone is welcome, so come on in. The party room is open! Tbone is back in the blogcast booth tonight for live play-by-play coverage of Episode 3. BPR's live coverage is for all those poor, lost souls suffering from Bravo deprivation. Tbone will give you the pertinent facts as they happen live. Remember, comments under this post are for Tbone's use only. Live episode chat is going on right now in the party room above! Fantasy Runway makes watching the show just a little bit more fun, doesn't it? BPR is offering this prize for the person who gets the most points this week. This is the gift bag from the Season Three Finale Show. It was donated to BPR by Angela Keslar. It includes the Elle bag, a copy of Elle magazine, A Project Runway T-shirt (size medium,) a pen (which I can not figure out how to work - sorry!) a mobile phone mirror, cosmetics and hair products. It doesn't matter if you haven't played before, please join us! Remember you can belong to more than one league. So, is everyone ready? All systems are go for tonight's new episode, which apparently has no title. Here's some possibilities: "Battle at 10 Rock", "Collaboration Aggravation", "Boys Just Want To Have Fun". I know you can do better - any suggestions? It's the usual lineup tonight: Tbone will be in doing play-by-play, the Party Room opens at 9:00 ET and the reactions thread will be up post-show. And speaking of post-show features, where is Andy Cohen's "Watch What Happens" webcast? We miss you Andy! There is plenty of excellent speculation still going on regarding tonight's challenge. (Click here for the preview videos.) And here's some breaking news! Bodog has just posted odds on who the Season 4 winner might be. Chris March has the surprising early lead at 5/1, and Sweet P is the long shot at 17/1. Place your bets! Our polls for Episode 2 are closed. You disagreed with the judges and felt that Elisa Jimenez deserved the win. Click here to see the results. You agreed with judges' choice of Marion Lee for the 'auf.' Click here to see the results. Check back with us tomorrow for our Episode 3 poll. TVGuide.com has an interview with Marion Lee. Our fearless handicapper Alan Gratz makes his predictions for episode three. Anyone else want to announce your picks? Meanwhile, Alan is traveling and has arrived in Birmingham Alabama in a hotel without Bravo! Are there any Birmingham BPRs who know of a bar or other spot hosting a viewing party tonight? Anyone willing to host a fan in your home? Here is how he describes himself: "I'm 35 years old, married with one kid, and don't smoke. I will also be clean-shaven, recently bathed, and promise not to talk until the commercial breaks." If you can help, please write to Alan Gratz. Thanks BPRs! Jeffrey Sebelia is appearing at the University of Rhode Island's Winterforce. We have recently discovered a new blog devoted to our favorite show. Please visit Project Stunway. 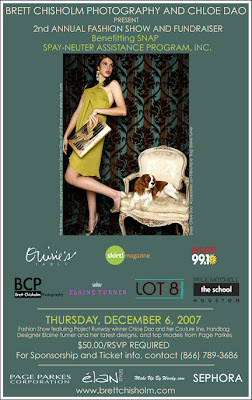 Attention Houston: Chloe Dao is showing her latest collection on Thursday, December 6th. 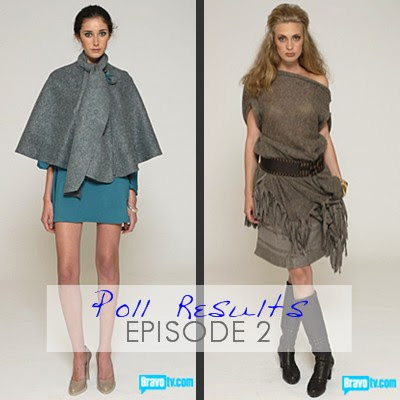 There is still time to vote in our Episode Two poll. Here is a clip of Tim on "Live with Regis and Kelly" yesterday. Project Runway was recently featured on NPR. There's a new interview with Tim Gunn in Phoenix's East Valley Tribune. Here is a great interview with Christian Siriano in JunkMag. Thanks Brad. Click here to read about how Nancy O'Dell transforms an outfit from "Day to Night." Thanks Mark. Let's see... where to start... I launched my jersey dress collection last year and it was a big hit (especially the hooded halter dress). After that, just as things were settling down, I got a job teaching a summer fashion design class to High School students out at Amherst college in MA. It's a really cool program called "Excel @ Amherst" and they had classes ranging from fashion design to international relations and history of war. I had 13 girls in my class from all over the country and even some from France and Italy! It was a ton of fun to teach the girls the basics of sewing and fashion design (almost none of them had ever sewn before) and after 4 weeks they even put on a fashion show of their work (you can view the video here and read more about my class here). After teaching, I came back home and had 2 wedding dresses (and 4 bridesmaids dresses!) to make. Making a wedding dress was a whole new world for me, but they both turned out well and I really enjoyed working on them (see one of them here). This fall I've been doing a lot of freelance textile design for Kohl's and focusing on the business side of my design company (this is definitely the part I don't like). I'm also in the process of designing some uniforms for the cocktail staff at a Ritz-Carlton hotel in Dallas! Currently, I've just started with the concept/sketching stage for my spring '08 collection which will launch in April (view some preliminary sketches at the very end of this post). The designs are going to be a mix of jersey with satin accents and I've been focusing on sourcing organic and/or sustainable jersey fabrics in order to move my collection and company into the green world. I feel like it's the least I can do to start helping with how we treat the world, but still be able to keep my current style and aesthetic. And on top of all that, Joe and I just started taking Salsa lessons ("Dancing with the Stars" here I come!) and we start teaching snowboarding next weekend. Phew... I think that's it! Thanks Katy! Calling all PR designers, send us your story - we would love to make this a regular feature. Former designers make the best recappers! Jay McCarroll: "i think i paid $10 to fart at mood once." Nick Verreos: "I invited friends over (Andrae stopped by and brought Gelato--Yeaaay!) and served Champagne and cookies." Malan Breton is sharing his thoughts with the Dallas Morning News. Needs Inspiration is one of our originals, and still one of the best! Don't miss Tim Gunn on "Live With Regis and Kelly" tomorrow. They are in the Bahamas! Here is a look at the new season from The Daily Californian. More about SJP, "Bitten" and Victorya Hong's winning design. Here is "Amanda's Take" on what I like to refer to as, "Episode 2, Attack of the Clones!" No, I am not a big fan of Star Wars, but this seemed to make sense. Why do I call this, "attack of the clones?" Well, it was obvious that Marion and Steve did not really know the aesthetic of "Bitten" and were just trying to vary up what Sarah Jessica Parker wore when she had her initial consultation with all of the designers. The other reason? 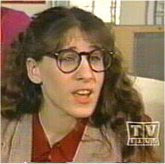 The model they chose to use on their team was obviously a pick because she looks a little like SJP. On November 20, Malan Breton hosted a trunk show to benefit Broadway Cares/Equity/Fight AIDS in at the Warwick Hotel in NY. Visitors got to talk with Malan while they shopped for clothing from his Spring 2008 collection. Malan was as dapper and charming as ever. We dished about the first episode of Project Runway Season 4. I would be a cad to mention his criticisms of the designers, but will share that his favorites this week included Christian and Jillian. He also talked about the options for his February 2008 fashion show – he might be in the Bryant Park tents next year! Last, but assuredly not least, we looked through his collection together, because I was not going to pass up this opportunity to own a Breton original. While I had attended his fashion show in September, it is a quite different experience to see the clothes up close, feel the fabrics, and examine the construction. The fabrics (silk organzas, mylars, chiffons and sateens) were so luxurious that you had to touch them. His designs evoke a more refined era, where people went to glamorous soirees – just what I expected adulthood to be like when I was a kid. Though –alas--that’s not my adult life, Malan did help me pick out clothes that would look good on me and fit my wardrobe needs. I coveted many of the outfits and purchased a stylish black silk skirt. Malan’s fashions will be available for sale from his website malanbreton.com in the next few weeks, and will cost from $300-950, which is reasonable given the fabrics, style, and workmanship. For those of you in NY (or planning to visit), I strongly recommend you visit his showroom (call 212-358-0892 for an appointment), so that you can meet with Malan to get the perfect fit and fabric (he will make fabric substitutions to suit your taste). We feel for the many Project Runway fans that do not have access to Bravo. We know that we have many readers from other countries or away at college that relied upon iTunes in order to watch their favorite show. Currently the only way that their addiction can be satisfied is via the fabulous parselforce. Season 3 designer Katherine Gerdes returns with her take on Episode 2, "I Started Crying". It's a BPR exclusive! First things… I have to give props to all the designers for the success of this challenge. I don’t know if you guys have ever shopped at Mood, but $15 does NOT get you much and to be honest I have no idea how they made this challenge work. For a company such as Steve and Barry’s (or Target which I know more about), they have the size and purchasing power to knock the price of fabric down so they can afford a $15 wholesale price, but buying retail fabrics and expecting wholesale garments is really challenging so I give props to all the designers! Before I get to the reviews, let me put out a blanket statement, so I don’t have to repeat myself over and over again: With the exception of Marion and Steven’s, I thought everyone’s garments look really well executed and properly finished and I imagine this is going to be the case for most of this season! Also… can I just ask what is up with the hair/styling this season? I don’t know if it’s a new team of stylists or what, but so far it’s been pretty bad this season. I’ve been watching PR this year with a group of girls who are all hair/makeup artists and they cannot stand what is going down the runway (and I’m not talking about the clothing). Click here to continue reading Katy's Take as she reviews each of the design's in detail. Attention Scottsdale, AZ: Tim Gunn will be at Dillard's in the Scottsdale Fashion Square on Thursday, November 29th at 6PM. He will be hosting a Liz Claiborne Holiday Event. More info here. Meanwhile, in Los Angeles, Heidi Klum, Dan Cutforth and Jane Lipsitz will be appearing at the Paley Center on December 4th at 7PM. Tickets are $25 each for non-members. Click here for more information and please let us know if you can attend. There is a great interview with Jack Mackenroth at De novo magazine. Here is a video interview with Kayne Gillaspie. If you are doing some on-line shopping this weekend, please check out the website of BPR friend and advertiser Kenneth Fron. Every necklace is one-of-a-kind and beautifully packaged for gift-giving! I have a confession to make. I have never heard of Steve and Barry's. I suppose they just don't have one in my community. But we were in San Diego for Thanksgiving and there at the end of Horton Plaza, I saw the sign! "Kaitlin, look! It's Steve and Barry's!" We still hadn't seen the episode and Kaitlin didn't want to be spoiled so she didn't even know about SJP. We entered and saw the big Project Runway poster and located Victorya's designs. They were well-displayed (although rather creased and wrinkled.) She preferred the dress in the burgundy fabric. When Kaitlin came out of the dressing room, we discovered two other young women also trying on the same thing. It looked good on everyone! Sorry so late this week recappers, too much turkey for Tbone! Aka "Contestants Taken Out of Comfort Zone"
Click here for Yahoo's preview video. What's going on here? Why aren't they showing us what happens at Rockefeller Center? Why are Jack's shorts so important? Discuss! Project Runway Model, Amanda Fields has agreed to write up a "model's take" on each episode. She will be focusing specifically on the models. Amanda has walked for many of the Project Runway designers from seasons two, three and four, as well as for many established designers including Monique L'huillier. We could not think of anyone more qualified to present her perspective of the Season Four Models. Thank you Amanda! "Models, this is a competition for you as well." This show can take a model from just another catalog girl to a high-powered, in-demand hot item. :) But even if you win, nothing is guaranteed past the Elle shoot! Since I made it to the top 5 models, I would like to personally pick a top 5. This is based on how the girls are ON THE RUNWAY and HOW THEY PHOTOGRAPH. That is how you should judge models. I would also love them to have a great personality, but as long as they aren't bitchy then it's all good! I also like Marie and Sam. Minumum of 5'9" to be a runway model. Otherwise you make a gown look less elegant and more frumpy. First model to go? I predict Ashley or Aviva. BPR reader Matthew snapped this photo of Victorya's winning design at the Manhattan Mall Steve & Barry's today. He adds: The dress in person was actually impressive. Last year I saw the window display at Macy's with all the winning designs from season 3. 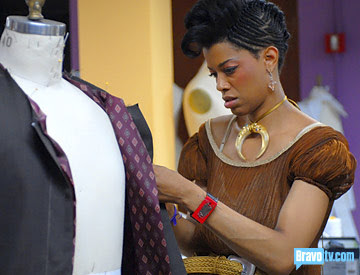 The threads were all popped and there was lots of mistakes in the winning dresses from season 3. They were still gorgeous but it was clear they were done in a rush. The dress at Steve and Barry's only had one popped seam on the arm sleeve where a loose thread was hanging out. Thanks Matthew! EW has an interview up with aufed designer Marion Lee where he says: ...I should have used jersey for all my challenges and I'd be in the final four. Why do they insist onhaving Heidi stil refer to a final 3 on the runway? Here's an interview with PR model Marie at After Ellen.com, thanks lala! Andy Cohen has a great post-episode interview up with SJP. Don't miss her revealing comments about the judging process. Victorya & Kevin's winning dress/vest combo goes on sale today at Steve & Barry's stores nationwide. The stretch-cotton dress($19.98) will be available in both black and burgundy, and the separate plaid vest ($14.98) comes in grey or black. The original design will also be on display at the company's Manhattan Mall flagship store beginning today. Miss the drama? You can always revisit the Keith/Jeffrey/Vincent/Angela reality opera on the Season 3 DVD. $19.99 at Amazon. Did you love the gold Chloe Dao dress worn by Heidi on the runway during the premiere? Chloe will be offering this dress in both the original gold and fuchsia silk satin, $224 at her Lot 8 boutique in Houston. For the bibliophile on your list, what better than fashion advice from the master. Tim Gunn's Guide To Style, of course! $12.21 at Amazon. And don't forget the official BPR Spreadshirt store where you can find a wide variety of shirts and other items to express your love for BPR. "Keep a Child Alive" is brought to you by the divine MsRoyalT. Click here to watch the rest of the episode. How grateful are we for MsRoyalT? Only those readers are eligible. The first one that answers ALL THREE of the following questions correctly IN THE COMMENTS will win the prize. Name the town in which the designers delivered mail in Season 1's Postal Challenge. Which eliminated model appeared in the Season 2 Reunion episode? Which designers' sisters appeared in the Everyday Woman Challenge in Season 3? ETA: Congratulations to TROPICALCHROME for answering all questions correctly. You presented a beautiful sketch and a strong idea to Sarah Jessica. Any doubts that SJP had about making the garment interesting were eliminated when she saw your ensemble come down the runway. You excelled as a team leader and the result of your collaboration, a dress and vest, was well-executed. You took a flattering silhouette, coupled it with a sophisticated palette and added construction detailing that resulted in a fashion forward look within a budget for the Bitten line. Brava, Victorya. This post is only for positive things to say about Victorya and/or the look that she created. If you have anything negative to say, click here for that venue. ETA: Let me remind you that this post is not for negativity. We treat the 'Congratulations' and 'BPR Love' posts as gifts to the designers. I wouldn't want to open a present and then find it was an opportunity for criticism. We have a reaction post (and they are always the most popular posts of the week) that allows our readers the opportunity to vent and critique. The concept you pitched to Sarah Jessica Parker was strong enough to earn the role of team leader. Your design may have been too ambitious and your fabric choice (on such a limited budget) was probably your worst enemy. But it was a pleasure to see you work with Steven and taking responsibility on the runway was honorable indeed. The finished garment looked far more expensive than your budget and even SJP likened it to Hermès. We already know that you are a success but we believe that even more opportunity will come your way because of this experience. This post is only for positive words for Marion Lee. If you have anything negative to say, please click here. You've seen the designs on the runway and now it's your turn to be the judges. This week you are Heidi Klum, Nina Garcia, Michael Kors and Sarah Jessica Parker. Did Project Runway carry the momentum from its strong start, or was this one a turkey? Post your reactions to Episode 2 here. BPR kicks off the Thanksgiving celebration early tonight as we open the party room and welcome Episode 2. We're looking for your best sass and snark as we find out who is "the biggest guest judge in Project Runway history". The pies are in the oven, the turkey is defrosted, you have all day tomorrow to worry about dinner. Right now, grab your beverage of choice and come on in. It's Project Runway party time! Tbone is back again tonight for live play-by-play coverage of Episode 2: "Money Changes Everything". Or is it "I started Crying"? Regardless, we'll bring you all the drama and surprise as it happens. A reminder that comments under this thread are for Tbone's use only. Party people are directed to the post above. Our polls for Episode 1 are closed. You disagreed with the judges and felt that Chris March deserved the win. Click here to see the results. You agreed with judges' choice of Simone LeBlanc for the 'auf.' Click here to see the results. Check back with us tomorrow for our Episode 2 poll. Once again, BPR is offering a prize to the Fantasy Runway player who scores the most points in tonight's challenge. This is the Bluefly gift bag from the Lincoln Center Fashion Show. It includes a $100.00 gift certificate that must be redeemed by December 15th. Of course you must be registered in the BPR League to win the prize. (Remember you can register for more than one league.) This prize is for tonight's results only. In the event of a tie, watch for the tiebreaker 'walk-off' questions. Your choices need to be locked in by 6:59 Eastern time. Oh, and the Grand Prize if you win Fantasy Runway is a trip for two, including airfare and hotel, to the Project Runway Finale Party hosted by TRESemmé. Still undecided about your picks? For a thorough and completely entertaining look at tonight's options - including his well-researched choices - check out Alan Gratz. Thanks Alan!! There is nothing quite like episode days in the BPR workroom, the place is buzzing with activity! And on top of the frenetic blogging, we are all busy baking, welcoming home family members, traveling and doing some last minute shopping in preparation for tomorrow. It's a first for Project Runway to have an episode the night before Thanksgiving and we hope you can watch along with us. We're excited to see "the biggest guest judge in Project Runway history"! Also, a quick thank you to everyone for your kind and thoughtful comments on our Tim's Take post. Rest assured that TPTB received your message loud and clear. We'll share any official information regarding the status of Tim's Take as soon as we can. In the meantime, Thank God It's Wednesday! Apparently tonight's episode is called "I Started Crying" because upon seeing the guest judge, one of the designers admitted that "I started crying" when he or she saw who it was. Anyone want to guess which one says this? Don't miss Ed Hill's fabulous recap on midseasonreplacements. Attention Chicago: Project Runway viewing party tonight at the Kit Kat Lounge and Supper Club. Possible Spoiler Alert: FWD is predicting a surprising guest judge. We'll have to watch what happens, won't we? This link includes video from Tim Gunn's appearance at an Arlington, TX shopping mall. Here is an interview with Victorya Hong's aunt, Suncha. I love hearing from the proud family members, don't you? The Fashion Informer has a great interview with Michael Kors. The TwoP recap of the premiere is up! There will be an episode of Tim Gunn's Guide to Style on Thanksgiving. Below are two videos that feature Gina, a curvy woman that loves embellished jeans. "Project Runway Flops Apartment Design" - it sounds like they could have used some help from their "Top Design" crew! The Fans Revolt - Where is Tim's Take? Everywhere you turn, Runway fans are asking the same thing: where is Tim Gunn's blog? Where is his podcast?? It almost doesn't matter what subject we post on BPR these days, someone inevitably asks if we know where these immensely popular features have gone. Our repeated attempts at getting to the bottom of this with our friends at Bravo have only elicited a cryptic response from Andy Cohen and a stock answer from one their press reps that "...Bravo is working on pulling all the elements of the brand new "Project Runway" site together...". Don't you think it would have been nice for Bravo to get the site pulled together before the new season launched? It's not as if they haven't had enough time. Bravo has had more than a year to plan since S3, primary filming on S4 was completed months ago and the premiere date was set weeks in advance. And yet the Season 4 site didn't go live until well after the premiere last Wednesday, missing some of its most popular features with no explanation. Meanwhile, we are being encouraged to check out the plethora of other blogs available at BravoTV.com. Let's see what they've got: there's Nina's blog; the "Burning Questions" blogs from Simone, Ricky, Elisa, Rami, Christian and Victorya; former contestants Alison Kelly, Daniel Vosovic, Malan Breton, Nick Verreos and Laura Bennett; the poor PA blogger who apparently wasn't allowed to tell us what her name was, and for some odd reason Lauri from "Real Housewives" is featured front and center on the Project Runway blog page. Joining Tim Gunn on the missing bloggers list this season is Michael Rucker, who built a cult following last season with his insider dirt and irreverent humor. We also miss Andy Cohen's campy, fun "Watch What Happens" online after-show. And good luck trying to download episodes online. NBC Uni has severed its ties with iTunes and recently launched its own poorly reviewed video download source, NBC Direct. Oh, you can see "Poker After Dark" there, but no Project Runway. For a network that frequently flaunts its reputation for innovative online content, these are glaring, inexcusable holes in the lineup for its franchise program. But let's be honest: its Tim's Take we miss the most. His blog and podcast were the perfect complement to the live episodes and fans flocked from all corners to read and hear what he had to say. Bravo has dropped the ball and as usual, the fans are left to suffer. You've seen the previews and we've already started in on the speculation here, but lets take a step back and see where we are. First we have the title of Episode 2: "Money Changes Everything". Is this a budget challenge? Which designers look like they would work well within a budget? Also, this is clearly a team challenge. Can we tell who is paired with whom? Are there teams of two? Many Project Runway designers are blogging about the new season. Jay McCarroll is blogging at Elle.com. 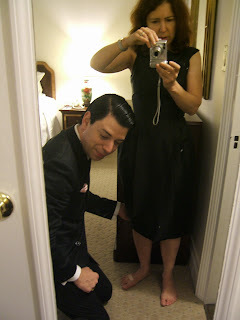 Alison Kelly and Malan Breton are blogging at Bravo.com. By the way, the photos accompanying the blogs and articles at the Bravo website seem to have no relation to the actual article. The exit article with Simone features a photo of Elisa. Malan's blog features a photo of Jillian. Of course, Nick Verreos is continuing to blog about season four, and also on Bravo. I know you have been ramping up the counter on the Bravo site looking all over for Tim's Take. It isn't there. Trust me. We'll keep checking. No podcast either. There must be other designers blogging about the new season, please let us know about them. Thanks, BPRs. Meanwhile, in other news.... Michael Rucker has a new haircut! Please say that you will continue with your fabulous recaps of Project Runway during season four. I don't think so. At least, not right now: ANTM is still on and I just can't do two shows at once lest my blog be entirely devoted to reality TV, and I'm not comfortable with that. I'm not closing the door entirely: if something comes up that speaks to me, I'll write about it, but I don't think anyone should be expecting full recaps. I'm going to do a little post explaining this because people have been asking. I'm definitely going to send them your way to fulfill their PR needs. Thanks for the kind words, too. I've always always always appreciated your support. Click here for the Fourfour recap of the Season Three Finale. Here is his recap of the Season Three Reunion. Here is his recap of the "Everyday Woman" challenge. Want something from Season Two? 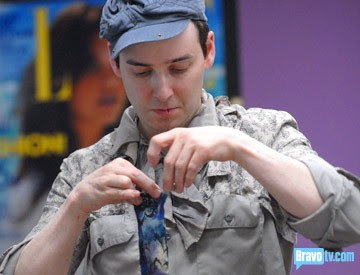 Here is a link to all of Rich's Project Runway posts. Please let him know that we will miss him this season. BPR welcomes back Season 3 designer Katherine Gerdes for her exclusive take on Season 4. Katy not only gives us her insight as a professional designer but also as a former contestant. Welcome back Katy! Yeah! Project Runway is back! Hopefully you guys are as excited as I am! Personally, I’m really hoping that the extra time they took to edit and put this season together will make it a much stronger show this time around. Before I start, I just want to make a quick disclaimer… I don’t know anything about the new show, or any “behind the scenes” details and I’ve never met any of the new designers. I know as much about this season as you guys do, so my opinions are based purely on what I see on Wednesday nights. I’m definitely not looking to offend or tear anyone’s designs apart (Project Rungay is where I go for that… Love TLO! ), but I’ll try to explain why I like or dislike the designs as nicely as I can. Please feel free to disagree with me, but as the season goes along, know that I’m not trying to pick on your favorite designer or dislike their designs based on the designers’ personalities. Thanks a lot to BPR for asking me to do “Katy’s Take” again! I just have to say quickly, that overall I was really impressed with the construction quality of most of the garments. I wasn’t into many of the actual designs, but the construction looked pretty good for almost everyone! Click here to continue reading Katy's Take as she responds to each of the designs from the Season 4 premiere. Meanwhile, in other news, Heidi Klum has been Fugged. Congratulations, Heidi. Thanks Michael. Here is an interview with Season Four model Samantha Ruggiero, from her hometown paper. There is still time to vote in our poll. If you haven't already, please join our Fantasy Runway League. (You can belong to more than one league.) Also we are looking for a couple of handicappers willing to go out on a limb and make some predictions for us. If you are willing, please let us know. Preview Videos - "Money Changes Everything"
Click here for Yahoo's preview which contains more model selection. Speculation: what is happening in this episode? Discuss! Our friends at Seenon.com have started the auctions for the Premiere Episode garments. Want to guess which one will sell for the highest price? Season Four Designer Tees are also available. This one is Jack's. Click here to see them all. Eric 3000 is back for Season 4! Beckyloo actually owns a Simone LeBlanc! And speaking of Elisa's, some of them even recap! Alan Gratz is a real, live author! Whew! Thanks recappers - you make the show much more fun! Project Runway sponsor and BPR friend Bluefly has a new feature called 'Shop the Runway.' Each week they will be presenting looks that emulate the style that wins the challenge. Don't forget to look at the things they are featuring in the Bluefly Accessory Wall - on Season Four of Project Runway the contestants get to select from top designers such as Balenciaga, Gucci, Christian Louboutin, Marc Jacobs and Stella McCartney. Bluefly also has their own blog called Flypaper - Stuck on Style (cute!) and they will continue to have features on Project Runway. And of course don't forget to enter The Ultimate Project Runway Sweepstakes! You can enter every day to try to win two tickets to the FINALE RUNWAY at Bryant Park in February plus a $5000 Bluefly shopping spree so you'll look like a proper fashionista at the event. It's a fun game to play and someone is going to win that enviable prize. Don't you think it should be a BPR reader? Make it work! Uncle Nick asks: Is this really THE MOST TALENTED bunch of designers ever? Ha! Who will Tiffany fall in love with this season? Bravo board legend ScubaOtter has resurfaced! If you missed The Manolo the first time, shame on you! Okay, we have a bunch more to share, but these should get you started. Stay tuned for Part 2! The Season Four Premiere of Project Runway drew record ratings! Is anyone surprised? Our friends at Buddy TV have an interview with Simone LeBlanc. There is another exit interview at EW.com. Yes, that is Candis Cayne modeling for Jack Mackenroth. Thanks Irene. Attention Arlington, Texas: Tim Gunn will be at the Dillard's at the Parks at Arlington Mall on Saturday at 1:00. Click here for more information. We would love a field report. Heidi Klum joined her husband in a duet at last night's concert at the Kodak Theater. They are practically Sonny and Cher! Here is a quick recap from the Seattle Post-Intelligencer. Of Course She Loved It! Who Will Win Tim's Book? It's a Walk Off! BPR Season 4 Premiere Party! 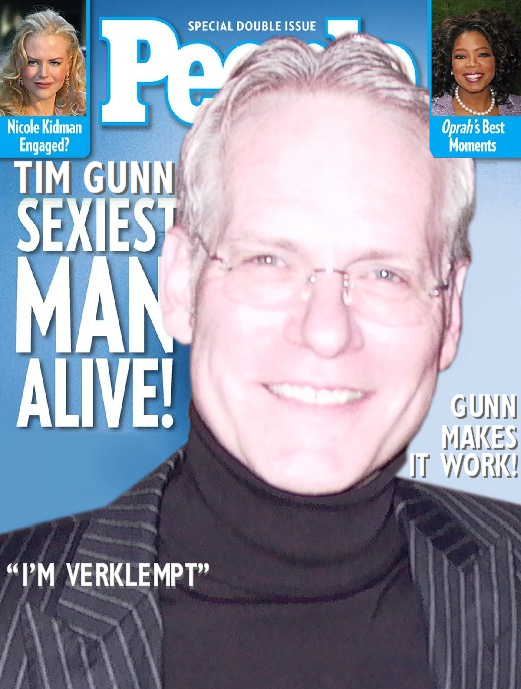 Win This Book Signed by Tim Gunn! Want to Attend the Project Runway Finale Party? ... I am deeply touched by the continually unbridled rallying for me. I just want you to know that it is returned in kind at every possible opportunity. I LOVE BPR!!! I Love BPR. Its been so much fun for me to learn more about the designers I was "In the trenches with .... I LOVE PROJECT RUNWAY and I LOVE WHAT YOU DO! Blogging Project Runway is the only website I go to now. I truly enjoy logging in and devouring everything that is posted. I am a regular reader of your blog. It's definitely the best one out there. For an unusually in-depth coverage of "Runway," there is, of course, Blogging Project Runway. ...As I'm sure you know, we are the biggest fans of BPR there are! I have to give a special shout-out to our friends at Blogging Project Runway ... an excellent fan site about the show ... they have great respect for the show and it shows through the site. Bravo, BPR! And thanks. ...this blog constitutes a significant popular culture and participation phenomenon. ...well-written, snarky, irreverant and much-linked-to...Blogging Project Runway has all the markings of a cult. ...for all the latest PR news, there's the exhaustive Blogging Project Runway, which takes their love of the show and spreads it to every nook and cranny of this country. Blogging Project Runway: No snark here. Just plenty of 'Runway' news and links to other sites. And of course don't let your boss catch you; Blogging Project Runway is almost as addictive as the show. And it is time to say farewell after covering Project Runway continuously since Season Two. Legal Mumbo Jumbo: This site is an unofficial Project Runway blog. It is not owned or operated by Bravo, Lifetime, Full Picture, Magical Elves, Bunim/Murray Productions or The Weinstein Company. And that's exactly how we like it. Blogging Project Runway is owned and operated by Blogging Reality Television LLC.